Today I'm giving away two beautiful items to help you jump-start your summer! 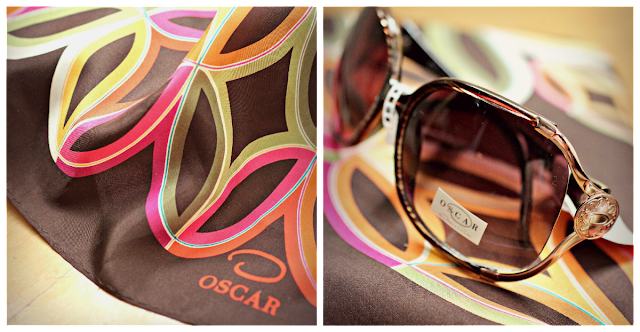 And I can't think of anything to help add a little more style to your summer looks than with some Oscar De La Renta. Take a peek! What: The Winner will receive a brand new pair of chic wide-lens UV absorptive sunglasses with gold trim, and a gorgeous geometric 100% silk scarf! Both items are exclusively Oscar De La Renta. Items total a value of $81.00!! How to enter: You must either be a follower via Google Friend Connect, or like my blog's page on Facebook!! (or both for two entries!) Leave a comment at the bottom telling me you are and that's it! The lucky winner who is chosen at random will be announced and contacted shortly after the giveaway concludes! Good Luck everyone!! I follow you on bloglovin!! Great giveaway!!! I'm following you via GFC! I'm following you via Bloglovin'! I've added you to my Etsy favorites! Following all of your pins! I'm favourited your Etsy shop. I missed your last giveaway, but I love this one! Pls include me :). I follow you on GFC and Facebook. And I follow your Pinterest board. Follow you back via GFC! I just favorited your Etsy shop! just added you to my etsy faves, love the quilts & cufflinks! I added your shop to my faves on Etsy! Im a new follower! Id love to win these for this super hot summer. Love love love your blog mama. I'm a follower on GFC! Love your blog! I added your shop to my faves! I follow you on Pinterest (Andrea Morris). I favorite your cutesy shop on Etsy (and will one day purchase from it!)! I posted about the giveaway on Facebook! I follow via GFC! ;) Naturally, I love your blog. I also follow via Facebook! I like your blog's Facebook page. I shared this giveaway on A Silver Snapshot's Facebook! I already follow you with GCF! I already follow you with Bloglovin', too! Your shop is already a favorite on Etsy! I shared this post on my FB! Hey Emily! Thank you so much for joining my blog. :) and, thanks for you sweet comment. I am loving your blog too. I am your newest follower here, Twitter, Pinterest and Facebook. Can't wait to read more! What an amazing giveaway! Thank you so much for it! I'm so excited - I really want to win this! Just wanted to pop by and say thank you for the super cute message and following my lil blog! I am so excited to tell you that I am your newest follower thus far! Have a wonderful day! I follow you on GFC, and I like your FB page. Thanks so much for hosting the giveaway! I'm following you on Pinterest as well. Thanks so much for stopping by! I'm following your blog! I follow you on Twitter (as CutesyBootsie). I follow your boards on Pinterest. i like you one fb. i heart your etsy shop! Love this blog. I'm a GFC follower! I follow you via GFC!! I follow via Bloglovin' ! !